NO expansion or game pack skills required for advancement so… YAY! Correction: ONE pack recommended but not required. The Herbalism skill required in all Basic Training levels came with Outdoor Retreat. Outdoor Retreat is NOT required for the career to work, you will simply need to use the cheat provided at the bottom of the page to advance to the next level. This has been requested multiple times by a few people. 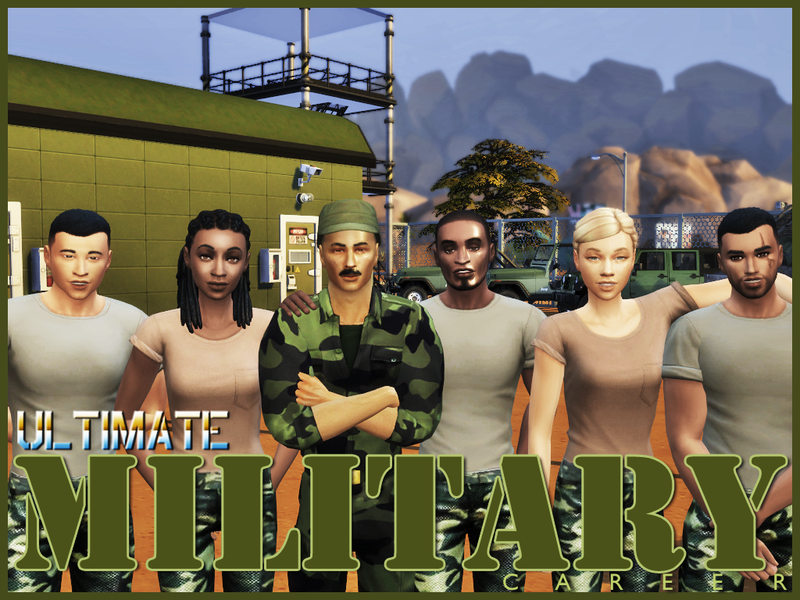 There are also a couple of Sims 4 military careers (including one by Neia, eep RESPECT!) and Sims 3 remakes out there. I highly recommend you search them out and see which one you’d like to have or have them all! So, why another one? Well, people asked for it, even when I pointed them to other ones. Also, my grandfather was a retired Navy veteran from WWII and my father served in the Army in Korea. I have an abiding respect for people who give up their time, sometimes life and personal safety to protect their country and others. I simply wanted to honor them in my own way. Ultimate Military has five paths (one for each branch of the military) and a minimum of 18 levels. It has almost all the actual ranks in each branch of the service. Senior enlisted ranks are skipped by a side trip to military college (which is actually possible). The career ranks and duties were thoroughly researched, but pay levels are mostly based on the Sims 3 military career. Like the actual military, all pay levels are the same for equivalent ranks in each branch. Oh! One last thing. Military CC is RIDICULOUSLY hard to find. I added links to what I found below in case anyone wants. The foundational strength of the Department of Defense is the men and women who serve our country and protect our freedoms. Your military is an all-volunteer force. They are mothers and fathers, sons and daughters, friends and neighbors. This is your chance to... imagine being one of them. The Army Junior Reserve Officer Training Corps (JROTC) is a program offered to high schools that teaches students (Cadets) character education, student achievement, wellness, leadership, and diversity. Although there is no military obligation to the JROTC, you know you what you want, and this is a great start to your military career. The Army Mission: To deploy, fight and win our nation’s wars by providing ready, prompt and sustained land dominance by Army forces across the full spectrum of conflict as part of the joint force. The Army mission is vital to the nation– its land, its resources and its population. This we will defend. Welcome to the toughest job you’ll ever love. Basic Combat Training (BCT), often referred to as “boot camp” by civilians, is a training course that transforms civilians into Soldiers. Recruits will learn basic tactical and survival skills along with how to shoot, rappel, and march. They will also learn the basics of Army life and military customs, including the Seven Core Army Values: Loyalty, Duty, Respect, Selfless Service, Honor, Integrity and Personal Courage. The rank of corporal was established in 1775 with the birth of the Army and the NCO Corps. Along with the rank of sergeant, the corporal is the only rank which has never disappeared from the NCO Corps. The rank of corporal has always been placed at the base of the NCO ranks. For the most part, corporals have served as the smallest unit leaders in the Army: principally, leaders of teams. Your dedication and command savvy has no gone noticed. Your Commanding Officer has recommended you to be one of the 85 enlisted personnel a year chosen to study at West Point. The United States Military Academy (USMA), also known as West Point, is a four-year federal service academy in West Point, New York. It was originally established as a fort that sits on strategic high ground overlooking the Hudson River. The academy bases a cadet's leadership experience as a development of all three pillars of performance: academics, physical, and military. Most graduates are commissioned as second lieutenants in the Army. Your West Point Graduation allowed you to move over the Sargent ranks and return as the Officer rank of Second Lieutenant. Now, addressed as "Lieutenant." Typically, the entry-level rank for most Commissioned Officers. You lead a platoon-size element consisting of the platoon SGT and two or more squads of 16 to 44 Soldiers. As a seasoned lieutenant with 18 to 24 months service, you lead more specialized weapons platoons and indirect fire computation centers. A Senior Lieutenant, is often selected to be the Executive Officer of a company-sized unit (110 to 140 personnel). Congratulations "Captain." With this promotion, you command and control a company-sized unit (62 to 190 Soldiers), together with a principal NCO assistant. You Instruct skills at service schools and The United States Army combat training centers and a Captain is often a Staff Officer at the battalion level. Moving on up! You’re now addressed as "Major." At this rank, you serve as primary Staff Officer for brigade and task force commands regarding personnel, logistical and operational missions. Now the rank and file call you “Lieutenant COLONEL.” This rank typically commands battalion-sized units (300 to 1,000 Soldiers), with a CSM as principal NCO assistant. May also be selected for brigade and task force Executive Officer. Ahhh… The coveted Silver Eagle. Many are chosen but few will be called to command brigade-sized units (3,000 to 5,000 Soldiers), with a CSM as principal NCO assistant. You may also act as the chief of divisional-level staff agencies. It one little Star but going forward you’ll be addressed as "General." You’ll serve as Deputy Commander to the commanding general for Army divisions. You also assist in overseeing the staff's planning and coordination of a mission. Two Stars anyone? You now command division-sized units (10,000 to 15,000 Soldiers). A Major General can only be appointed through a stringent process of nomination and review by multiple offices and promotion boards. Officers receiving a commission as Major General are required to retire after five years of commission, or after 35 years of total service, unless promoted or reappointed. At three Stars, you command corps-sized units (20,000 to 45,000 Soldiers), or occasionally act as a senior staff officer or department head in various domestic and overseas headquarters. "General." This senior level of Commissioned Officer typically has over 30 years of experience and service. You command all operations that fall within your geographical area. The Chief of Staff of the Army is a four-star General. The Chief of Staff of the Army is a statutory office held by a four-star general in the United States Army. As the most senior uniformed officer assigned to serve in the Department of the Army, the CSA is the principal military adviser and a deputy to the Secretary of the Army. The sea is an incredible beast. It reaches impossible speeds, depths and distances. It cannot be beaten with the strongest fist, the sharpest knife or the fastest bullet. In America's Navy, water and salt flow through our veins in the same proportion as the sea. We are America's Navy. And we are all Forged by the Sea. The U.S. Navy only has one location for its boot camp: Great Lakes Naval Training Center, on the western shore of Lake Michigan, near Chicago. Navy boot camp consists of eight weeks of training. This is where the Navy molds its newbies into ensigns, putting them through the arduous basic training that will serve them throughout their military careers. Seaman Recruit (SR) is the lowest enlisted rank in the U.S. Navy, just below Seaman Apprentice. Navy Seaman recruits currently do not bear any uniform rank insignia. The Navy will automatically advance you to E-2 when they have completed six months’ time-in-service (TIS), assuming you stay out of trouble and your performance remains satisfactory. Promotion to Petty Officer Third Class (PO3) is not simply a raise in pay. It is a shift in roles, from one who has been led, to one who must now lead. It is an assumption of higher responsibility, authority, and accountability. As a Petty Officer you will not only be responsible for your subordinates, you will also be responsible to your subordinates. Promotion to Petty Officer Second Class (PO2) is not simply a raise in pay. It means increased expectations in both technical expertise and leadership abilities. As a Petty Officer 2nd Class your level of authority will not change, but you will be expected to manage more resources and larger work groups or watch sections. In addition, as a Petty Officer you will be responsible for and to your subordinates. Petty Officer First Class (PO1) is commonly referred as the point where the "rubber meets the road"; it marks a transition from Junior to Senior Petty Officer. Your promotion to 1st class also means increased expectations in both your technical expertise and leadership abilities, and a time for you to prepare for the next big step in your career, Chief Petty Officer. In the United States Navy -- and only in the United States Navy -- the rank of E7 carries with it unique responsibilities and privileges you are now bound to observe and expected to fulfill. Your entire way of life is now changed. More will be expected of you; more will be demanded of you. Not because you are a E7 but because you are now a Chief Petty Officer. You have not merely been promoted one pay grade, you have joined an exclusive fellowship and, as in all fellowships, you have a special responsibility to your comrades, even as they have a special responsibility to you. You’ve been selected as officer material and recommended to the United States Naval Academy! USNA is a four-year coeducational federal service academy adjacent to Annapolis, Maryland. The entire campus (known to insiders as "the Yard") is a National Historic Landmark. Students are officers-in-training and are referred to as midshipmen. Graduates are usually commissioned as ensigns in the Navy. This is the initial Commissioned Officer rank held by graduates of the United States Naval Academy (USNA), Navy Reserve Officer Training Corps (NROTC), Officer Candidate School (OCS) and other commissioning sources. Generally, most Ensigns are in various schools training for their respective warfare or staff specialties. Others, serving in the Fleet, are Division Officers. Promotion occurs approximately two years after commissioning as an Ensign. Some officers may still be in schools training for their warfare or staff specialty. Others may be serving in the Fleet as Division Officers. You have been promoted. Congrats! A Department Head or Executive Officer on a ship, aircraft squadron, or submarine. On SEAL Teams LCDR serve as Executive Officers. Some officers serve as a Commanding Officer of a Minesweeper or a Patrol Craft. You’re now an Executive Officer! As a Senior Officer, a CDR may command a Frigate, Destroyer, Fast Attack Submarine, Smaller Amphibious Ship, Aviation Squadron, SEAL Team, or shore installation. Options! Oh Captain, my Captain! You now serve as a Commanding Officers of Major Commands such as Aircraft Carriers, Amphibious Assault Ships, Cruisers, Destroyer Squadrons, Carrier Air Wings, Ballistic Missile Submarines, Submarine Squadrons, SEAL Groups and major shore installations. A one-star rank, it is the first of the Flag Ranks. Your at sea commands may include commanding an Amphibious Group, Carrier-Cruiser Group, Carrier or Expeditionary Strike Group. Flag Officers also may be assigned as deputies to larger commands. Ohhh… a two-star rank! At sea commands include commanding an Amphibious Group, Carrier-Cruiser Group, Carrier or Expeditionary Strike Group. Flag Officers also may be assigned as deputies to larger commands. You’re now a three-star rank. At this rank you may command numbered fleets or hold a position as deputy for regional commands. Admirals are leaders at a very high strategic level. As the most senior Flag Rank becoming an Admiral isn't inevitable like a caterpillar turning into a butterfly. It is more like the odds of carbon being turned into a diamond. It's rare. Assignments for Admirals include Commanders of Regional Commands, Joint Commands, Chief of Naval Operations, and Chairman of the Joint Chiefs of Staff. The Chief of Naval Operations (CNO) is the highest-ranking officer and professional head of the United States Navy. The position is a statutory office held by a four-star admiral who is a military adviser and deputy to the Secretary of the Navy. Despite the title, the CNO does not have operational command authority over Naval forces. The CNO is an administrative position based in the Pentagon, and exercises supervision of Navy organizations. YOU are now the highest-ranking officer on active duty in the U.S. Navy. The mission of the United States Air Force is to fly, fight and win in air, space and cyberspace. Our rich history and our vision guide our Airmen as we pursue our mission with excellence and integrity to become leaders, innovators and warriors. We pursue our mission with excellence and integrity. We aim high. Most airmen graduate basic military training with the rank of Airman Basic (E-1). You are no exception. As, an Airman Basic you are an apprentice who is acquiring and demonstrating knowledge of military customs, courtesies, traditions, and Air Force standards, while learning both military and technical skills. While still primarily an apprentice, you’re expected to understand and conform to military standards. You’ve been promoted to Airman. The rank of Airman brings with it the responsibility of adjusting to the Air Force way of military life and becoming proficient in an Air Force occupational specialty. FYI, upon leaving basic training, all Airmen enter training at Air Force schools in their specialties ("jobs"), depending on their aptitudes and interests, and the needs of the Air Force. As Airmen First Class you are now considered to be fully adjusted to Air Force and military life, and your new duties focus on efficiently and effectively carrying out your assignments and honing your job skills. Airmen First Class are assigned an increasing level of responsibility. You’re expected to comply with Air Force standards and serve as a role model for subordinates. In addition, you are expected to start mastering your job and leadership skills. The rank of Senior Airman is a transition period from journeyman to Non-Commissioned Officer (NCO). It is essential that Airmen develop supervisory and leadership skills through Professional Military Experience (PME) and individual study. You’re expected to conduct yourself in accordance with established standards, provide a positive influence and example for your subordinates and peers alike. As Senior Airmen, you present the image of competence, integrity, and pride. The Staff Sergeant (SSgt) is the first level of the Non-Commissioned Officer (NCO) ranks in the Air Force. The Staff Sergeant's considered a craftsman with specific NCO supervisory responsibilities and may hold either a 5- (journeyman) or 7- (craftsman) skill level. Additionally, as SSgt you must continuously strive to further your development as a technician and a supervisor. The average Air Force wide active duty time for promotion to the rank of Staff Sergeant is over 4 years. You made it in the minimum 3 years Time-in-Serve and 6 months Time-in-Grade. Your dedication and leadership ability have not gone unnoticed and your Command Chief Master Sergeant is recommending you for the Air Force Academy! The United States Air Force Academy (also known as USAFA, the Air Force Academy, or the Academy), is a military academy for officer cadets of the United States Air Force. Its campus is located in the western United States in Colorado, immediately north of Colorado Springs in El Paso County. The Academy's stated mission is "to educate, train, and inspire men and women to become leaders of character, motivated to lead the United States Air Force in service to our nation.” Graduates of the Academy's four-year program receive a Bachelor of Science degree and are commissioned as second lieutenants in the U.S. Air Force. The rank of Second Lieutenant is shown through a single gold bar. And your gold bar is precious to you! Proper forms of address include “Second Lieutenant” or “Lieutenant.” Commissioned Airman may sometimes skip this rank. But, you don’t care, the sound of the word, “Lieutenant” sounds like a mini-symphony every time you hear it! Trade that gold bar in for a silver one First Lieutenant! First Lieutenants have roughly the same responsibilities as a Second Lieutenant but receive higher pay and are given more responsibility. As First Lieutenant you could be a flight commander or section officer with varying responsibilities, including supervision of as many as 100+ personnel. Captains are typically assigned to and have authority over a company. In such a position, they are referred to as the company commander. You are now a Captain! Captains are expected to be the senior leaders that enlisted personnel can approach. You’re also still heavily involved in the daily functions and responsibilities of your enlisted personnel. This is major, Major! A junior Field Officer rank, Majors in the Air Force operate as main staff officers on brigade-sized forces. Upon promotion from captain to major, you are now expected to become more involved on the administrative side of the squadron and wing level. You’re expected to be the senior leader that young lieutenants and captains can rely on for guidance and instruction. You also serve as an intermediary between the young officers and the upper brass. The 21st rank in the U.S. Air Force, a Lieutenant Colonel is responsible for commanding a medical or support group, a squadron, or directing ops in the operations group. As your new rank suggests, you’re basically a colonel's assistant and the duties reflect that analogy. You’re very involved in command roles and preparing for wing level command positions in the future. Colonels in the Air Force serve in a number of different roles. Some command elements of a wing while others serve as heads of staff in different Air Force staff agencies. Colonels are usually group or wing commanders. You’re now in charge of a wing. A typical wing may consist between 1,000 to 4,000 airmen but it is not uncommon to have many more airmen. You also wear the coveted silver eagle, so… bonus! Becoming a Brigadier General was an arduous process. It began with a board of general officers creating a list of candidates and ended with the President choosing those to be promoted from that pool. Brigadier generals are most certainly career officers who have demonstrated a high aptitude for leadership and management over the span of their careers. You are no exception and are fully involved with the administrative and operational level of the Air Force. You serve as the “face” of your base. You also participate in morale events like motivational speeches, hosting morale days on base, and squadron/wing visits. A two-star rank, Major General is the highest rank an Airman can achieve during peacetime. The promotion process is mostly similar to the process in becoming a Brigadier General. Once again, you were selected! As Major Generals, you can serve in a variety of high-level command positions: Number Air Force commanders, joint force commanders, air operations centers, training programs, or logistics operations centers. Your current role is vice commander to a lieutenant general. Ultimately, major generals you have around 10,000 airmen under your command. You still do the moral visits too! Three stars!!! Lieutenant Generals are picked by the president from the existing pool of Air Force General Officers. Their rank is temporary and is removed when they end their term. No more than 25% of all Air Force general officers may have more than two stars. As a result, yours is a very high command position. You command a large Numbered Air Force. Lieutenant generals may also serve in any of the high-level headquarters including the Pentagon. The Chief of Staff of the Air Force is a statutory office held by a four-star general in the United States Air Force, and you are now the most senior uniformed officer assigned to serve in the Department of the Air Force. You’re the principal military adviser and a deputy to the Secretary of the Air Force; and in a separate capacity are a member of the Joint Chiefs of Staff, and thereby a military adviser to the National Security Council, the Secretary of Defense, and… the President. Marines are trained to improvise, adapt and overcome any obstacle in whatever situation they are needed. They have the willingness to engage and the determination to defeat the enemy until victory is seized. These capabilities and leadership qualities make the Marines our nation’s first line of defense. Semper Fidelis. Marine boot camp is extremely challenging – both physically and mentally – considered to be tougher than the basic training programs of any of the other military services. All recruits go to one of two locations for basic training; Recruit Training Depot at Parris Island, South Carolina, or Recruit Training Depot at San Diego, California. Some believe that Marines are forged in a furnace of shared hardship and tough training. Shared, intense experience creates a bond so strong between Marines that nothing can stop them from accomplishing their mission! The rank of Lance Corporal (LCpl) was first used by the Marines in the Indian Wars of the 1830s. Lance Corporal is your next step in becoming an integral part of the Marine Corps. Lance Corporals are expected continue to apply their technical training, in addition to learning and developing leadership skills. Unlike the ranks of PFC and LCpl, to be worthy of the title "Non-Commissioned Officer" you must demonstrate that you are capable of meeting the demands of the next higher grade by meeting both basic eligibility requirements and competing in a Marine Corps-wide Composite Score competition, which is intended to promote the best qualified candidates. Corporal (E-4) is the most junior of the non-commissioned officer NCO ranks. However, that does not lessen the authority or responsibility the rank carries. Corporals are required to exercise an ever-increasing degree of maturity, leadership, and professionalism. To a large extent, accomplishment of the ultimate mission – success in battle – depends on the Cpl's development as a small unit leader and his or her professional abilities. Corporal's demonstrate that they are worthy of being "NCOs." However, to move up to Sergeant they must prove that they are capable of meeting the increased demands of the next higher grade by meeting both basic eligibility requirements and competing in a Marine Corps-wide Composite Score competition, intended to promote only the best qualified candidates. The Marine Corps rank of Sergeant (E-5) closely parallels that of the Corporal in duties and responsibilities. In fact, the basic duties and responsibilities of all the non-commissioned officer (NCO) ranks never change. The major difference between the sergeant and the corporal is that the sergeant is in daily contact with larger numbers of Marines and generally has more equipment and other property to maintain. Marine Corps Sergeants are required to exercise an ever-increasing degree of maturity, leadership, and professionalism. To a large extent, accomplishment of the ultimate mission – success in battle – depends on the Sergeants leadership and professional abilities. Second Lieutenant is the first rank a commissioned officer makes when joining the U.S. Marine Corps. Due to their inexperience, they are often guided by senior officers or warrant officers. Nicknames for Second Lieutenant include "nugget" and "butterbar" due to their insignia being a single gold bar. You’ve been placed in command of all-purpose ground combat unit, with more-specialized platoons reserved for the more-experienced first lieutenants. You’ve attained the rank of First Lieutenant! This rank is usually automatically attained after a Marine has served for two years as a 2nd Lt. Promotion to First Lieutenant generally leads to bigger paychecks, more responsibility, and future chances for promotion. Captains in the Marine Corps are responsible for individual companies, and act as Company Commander for 62 to 190 Marines. Captains are generally promoted from Lieutenants. You are now in charge of the tactical and everyday operations of your company, are often assisted by junior commissioned and non-commissioned officers. Officer at the battalion level. Your continued displays of leadership and your experience have earned you the promotion of Major. Unlike an Officer's first two career promotions, achieving the rank of Major is competitive, with roughly 80% of Captains progressing forward. For any given community, the Officer must submit an application, once eligible, to an approval board. They must qualitatively demonstrate a history of strong leadership. They must have significant operational experience within their profession. You act as a senior staff officer at the squadron and wing levels. When working in mission support or maintenance groups majors are usually squadron commanders! Lieutenant Colonels are the second field officer grade in the U.S. Marine Corps. You command between 300 and 1,000 Marines at a given time and are assisted by one Major, junior commissioned officers, and one Command Sergeant Major as an enlisted adviser. Colonels in the U.S. Marine Corps typically go to the Army War College in Pennsylvania or the Marine Corps War College in Virginia. It is the final “stepping stone” before reaching the General Officer ranks. It’s so close, you can almost taste it, but for now, command Marine Corps regiment consisting of three to five battalions, with the assistance of several junior commissioned officers and a Command Sergeant Major as a primary non-commissioned officer advisor. You’ve reached the lowest of the General Officer ranks. Brigadier Generals in the Marine Corps are one-star General Officers. You serve as the advisor and Deputy Commander to a Major General commanding a division-sized unit of 10,000 to 15,000 Marines and assist in overseeing the tactical planning and coordination of division operations. Brigadier Generals must retire five years after achieving the rank or once 30 years cumulative service has been reached, whichever comes first. The only exception to this rule is to receive a promotion. A two-star general, Major Generals command a division-sized unit of 10,000 to 15,000 soldiers. A Major General can only be appointed through a stringent process of nomination and review by multiple offices and promotion boards. As a Major General you are required to retire after five years of commission, or after 35 years of total service, unless promoted or reappointed. You have no intention of retiring! Considered a temporary rank, Lieutenant Generals retire once their active tour of duty or service comes to an end. They must retire after 38 years in the service or a month after turning 64. Lieutenant Generals can extend their status only through an act of Congress. As a three-star General, you command a corps-sized unit of 20,000 to 45,000 Marines and may occasionally serve as a senior staff officer or department head in a domestic and overseas headquarters. The Marine Corps can have a maximum of sixty general officers, and of these only three may hold a four-star rank at any one time. You’ve been nominated for office by the President and confirmed for duty by the Senate. You are now a four-star General. You’ve reached the highest rank you can achieve as a Marine… almost. The Commandant of the Marine Corps (CMC) is normally the highest-ranking officer in the United States Marine Corps and is a member of the Joint Chiefs of Staff. As CMC, you report directly to the United States Secretary of the Navy and are responsible for ensuring the organization, policy, plans, and programs for the Marine Corps as well as advising the President, the Secretary of Defense, the National Security Council, the Homeland Security Council and the Secretary of the Navy on matters involving the Marine Corps. The Coast Guard is America's maritime first responder. The Coast Guard is an agile and adaptive problem solver, with a bias for action, and ever vigilant in order to prevent the next maritime disaster and respond when we are needed. Semper Paratus is more than a motto — it's our core purpose. Always ready. Just like the Air Force and the Navy, the Coast Guard only has one location for enlisted boot camp: Cape May, New Jersey. Male and female recruits train together. You'll be challenged every day, both mentally and physically. You'll be pushed, tested and worked harder than you ever thought possible. But you will graduate confident, knowing you accomplished something you and your family can be proud of. Seaman Recruit (SR) is the lowest enlisted rank in the U.S. Coast Guard, just below Seaman Apprentice. Two separate pay grades exist within this rank — one for those with service of less than four months, with a higher pay scale for those in service for more than four months, even if they have not yet advanced to Seaman Apprentice. Coast Guard Seaman Recruits currently do not normally bear any uniform rank insignia. The actual title for an E-2 in the U.S. Coast Guard varies based on the type of work they are doing or the career path they have chosen as noted above. Those in the general deck and administrative community are Seamen Apprentice. They wear White stripes on blue uniforms. Those in the engineering and hull community are called Firemen Apprentice and wear red strips on a blue background. Those in the aviation community are called Airmen Apprentice and wear green stripes on both navy blue and white uniforms. As long as you don’t have to wear the red shirt, you’re good. As with Seamen Apprentice (SA), the actual title for an E-3 in the Coast Guard depends on the work area and career path the member has been assigned. As a Seamen, your duties include ship maintenance; equipment maintenance, repair, and storage for underway operations; lookout and helmsmen duties; serving as a member of damage control, emergency and security alert teams; participating in naval ceremonies; and working with qualified personnel to gain job training and experience. Your promotion to Petty Officer Third Class is not simply a raise in pay. It is a shift in roles, from one who has been led, to one who must now lead. It is an assumption of higher responsibility, authority, and accountability. Navy Petty Officers are not only responsible for their own performance, they are also responsible to and for their subordinates. Like each grade before it and those that follow the job of the Petty Officer Second Class is not much different, but the expectations in both technical expertise and leadership abilities is greatly increased. Your level of authority has not increase substantially, but the number of resources - equipment, work groups and watch sections have and will increase with advancement. Petty Officer First Class is the rank where the "rubber meets the road"; it marks a transition process from Junior to Senior Petty Officer and a time for transition and training to become a Chief Petty Officer. Now that you’re a Petty Officer 1st Classes, your level of authority is usually much greater than the PO2. Some PO1s may have the opportunity to become an Executive Petty Officer, or even the Officer in Charge of a small unit of their own! At a minimum though, you’re now expected to apply your experience, and judgment to manage a greater number resources and personnel then at your previous pay grades. Congratulations. You’re now a Chief Petty Officer! Coast Guard Chief Petty Officers are accountable for leading Coast Guardsman and applying their own experience and skills to enable mission accomplishment while exemplifying the Coast Guard’s core values. In addition, CPOs are responsible for developing enlisted and junior officers. Each unit's performance is a direct reflection of its Chief Petty Officers! The Chief’s professionalism, performance, and hard work are reflected in the unit’s morale, performance and professionalism. Your performance and the hard work and professionalism of your unit have not gone unnoticed. With your superior officer’s blessing, you’ve applied for and been accepted into the USCGA! The United States Coast Guard Academy (USCGA) is the service academy of the United States Coast Guard, founded in 1876 and located in New London, Connecticut. It is the smallest of the five federal service academies and provides education to future Coast Guard officers in one of nine major fields of study. Unlike the other service academies, admission to the Coast Guard Academy does not require a congressional nomination. All graduating cadets earn commissions as ensigns in the United States Coast Guard. You’ve returned to active duty with the rank of Ensign! Ensign is the most junior commissioned officer's rank in the U.S. Coast Guard and is equivalent to the rank of Second Lieutenant in the other armed services. Ensigns generally serve on Coast Guard vessels as division officers, which are responsible for leading a crew of seamen and petty officers in a specific division like engineering or administration. As a junior officer, you also engage in on-the-job training and receive mentoring and training from superior officers and experienced petty officers. Promotion to Lieutenant Junior Grade from Ensign usually occurs about eighteen months after an officer has received their commission as an Ensign. Based on your experience and display of leadership skills, at the discretion of your commanding officer, you have been promoted early. You serve as billeted division officer leading a group of seamen and petty officers in the ship Engineering division. On smaller Coast Guard cutters and other vessels, the position of First Lieutenant may sometimes be filled by a senior petty officer. Yours is a larger vessel so you are the senior Division Officer. The enhanced leadership and responsibilities mean you now serve as second in command aboard your ship, and command groups of sailors and petty officers in various divisions including the deck department, engineering, and others. Lieutenant Commander is the fourth commissioned officer's rank in the U.S. Coast Guard and is equivalent to the rank of Major in the other Armed Services. Lieutenant Commanders generally serve as mid-ranking officers in the executive and command divisions of Coast Guard vessels. A Lieutenant Commander wears a uniform like that of a Line Officer, with the main difference being the lack of golden cap-brim embellishments; the hats with gold rims are known as known as "scrambled eggs". Those scrambled eggs would look good on you! Well you got your “eggs!” You are now a Commander in the US Coast Guard and serve as the captain of a small Coast Guard cutter. You also lead squadrons of aircraft and may even be placed in charge of a small shore mission or serve on the staff of a senior officer aboard a larger Coast Guard vessel! Captain is a senior commissioned officer's rank in the United States Coast Guard and is equivalent to the rank of Major in the other Armed Services. You now hold a high-level leadership position commanding a large Coast high endurance cutter. As Captain, you have a great deal of autonomy in commanding your vessel, and those who prove their leadership and dedication over several years of service may be rewarded by receiving command of a larger and more important vessel or installation. After nomination by the President, candidates must be approved by the U.S. Senate by majority vote before being approved for promotion upon assumption of their new duties. You have been approved and promoted to Rear Admiral Lower Half! By tradition, all active flag officers welcome and congratulate newly confirmed flag officers with a personal letter following their promotion. It’s a huge achievement. You now command a small flotilla of ships. Time for another round of letters! Rear Admiral is the highest rank in the Coast Guard maintained during peacetime, as all higher ranks are temporary and linked to a specific position. As Rear Admiral, you command a fleet of Coast Guard ships and air wings. As a flag officer, you may fly the Rear Admiral's pennant over any ship or base on which you are serving - two white stars on a navy-blue background. The Commandant of the United States Coast Guard is the service chief and highest-ranking member of the United States Coast Guard. The Commandant is an admiral, appointed for a four-year term by the President of the United States upon confirmation by the United States Senate. As Commandant, you maintain operational command over the Coast Guard and are the top service official, responsible for all world-wide Coast Guard activities. YOU oversee 41,700 active-duty military; 7,800 reserve military part-time employees; 8,300 civilian full-time employees; and 31,000 civilian auxiliary volunteers. Thank you so much in advance if you decide to try Ultimate Military. I hope your Sim enjoys living ALL their military dreams. US Military sites for a lot of the text I tweaked.